The Burleson Files | Shorten the Curve. Amazon will add 120,000 new seasonal employees this year, up 20%. (Source: Wall Street Journal) What could be more impressive than Amazon’s seasonal growth data? 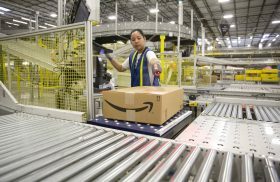 Consider this: Amazon has reduced the on-boarding time for new warehouse employees from 6 weeks to 2 days. Automation has been implemented in every nook and cranny of their business. Something we started back in 2009 with InfusionSoft. It boosted our employee productivity, eliminated errors and streamlined consistency in the patient experience. At Amazon, scanners and flat screens tell warehouse employees which box to use for each order. A machine then spits out a piece of pre-cut tape, specific to that box size. The shorter the learning curve for on-boarding new employees, the less you are held hostage by the threat of employee turnover. The reason most orthodontists put up with crappy staff is the same reason Amazon installed metal detectors to cut down on employee theft from their warehouses. If it takes 6 weeks to get Bill up to speed on working in the warehouse, Bill’s bad behavior gets tolerated more than it does when the turnover time is 2 days. Bill’s late to work again? He failed his drug test? He won’t stop smoking in designated non-smoking areas? Someone said Bill might be stealing from the warehouse? All of this gets “managed” and “tolerated” in a system where it takes 6 weeks to replace Bill. Shorten that learning curve to 2 days and Bill gets fired. The thought of training someone new for 6 weeks no longer cripples management. Bill just struck out? No problem! Next batter up. Shorten the learning curve in your on-boarding process and stop holding yourself hostage to the threat of employee turnover. Our proprietary 120-hour training system takes anyone off the street with a good attitude and problem-solving skills and teaches them the required core competency in order to be turned loose in front of a patient on their own, in 120 hours or less. Three weeks. No-where near as good as Amazon’s 2 days but we are doing more than just packing boxes. Compare 3 weeks to our traditional and industry average of 90 days and we’re way ahead of the curve. 3 weeks versus 3 months gives our doctors and managers lots of freedom to bring in the next batter when Bill strikes out. How steep is the learning curve in your practice? How much longer will you be held hostage by the threat of employee turnover?